Male Burket’s warbler shows off two symmetrically-placed, albeit faint, rufous spots on either side of his neck. Brewster’s warbler got its name in 1874 after it was described by William Brewster, who discovered it in Massachusetts. Initially thought to be a new species, the bird was given the scientific name Vermivora leucobronchialis, but Brewster’s warbler is now known to be a hybrid between blue-winged and golden-winged warblers; Vermivora cyanoptera X Vermivora chrysoptera. Brewster’s warblers typically feature genetically dominant plumage characters and patterns — for example, the black line through its eye and the distinctively separated wingbars come from the blue-winged warbler, whereas the creamy yellow underparts and yellow wing bars come from the golden-winged warbler. Song is one of several “diagnostic cues” that other songbirds - and birders! - rely upon to identify species. Each species sings its own distinctive song, which is how a female finds a mate of the correct species. Nestlings of both sexes learn their species’s songs by listening to their fathers and to nearby males of the same species whilst still in the nest. Thus, this mystery bird’s song would be diagnostic for which species was its father. A few weeks later, Mr Burket got his wish: he videoed the mystery bird singing on two consecutive days. The audio was high enough quality that he could identify the species song. He discovered that the mystery bird was indeed, singing a chestnut-sided warbler song. Could this mystery bird possibly be a hybrid with a Brewster’s warbler hybrid mother and a chestnut-sided warbler father? 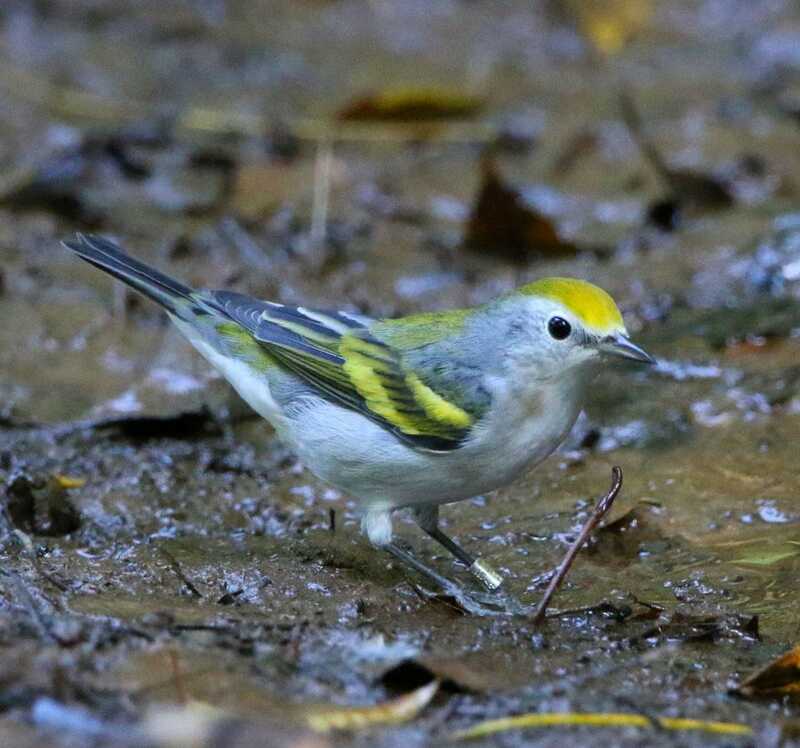 Mr Burket reviewed his bird photographs from the previous year and spotted a female Brewster’s warbler at the birdhole during the breeding season. 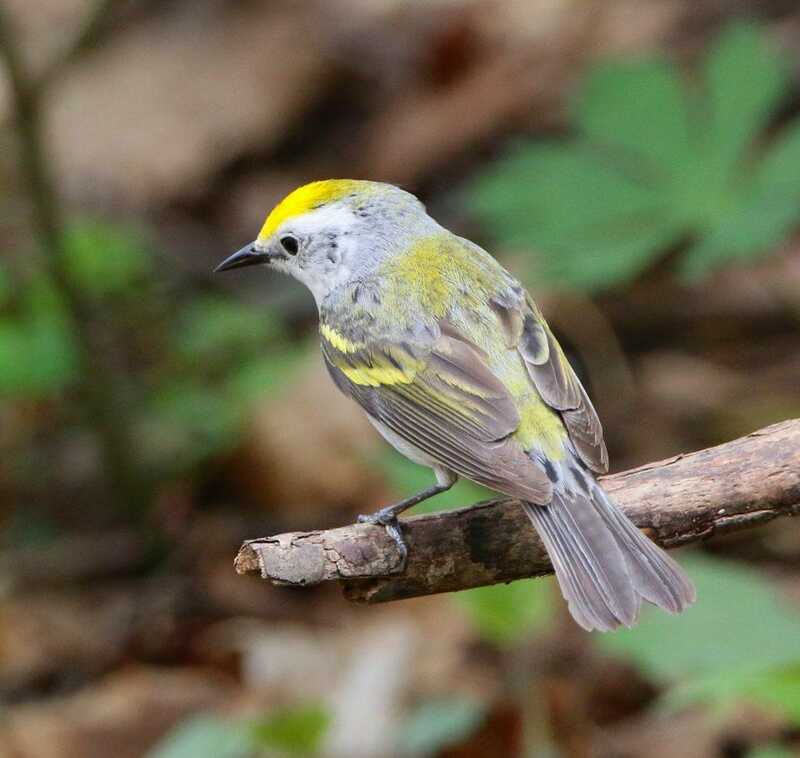 He also knew that chestnut-sided warblers breed in the woods on his property, so … could it be possible that this was a never-before-seen naturally-occurring “triple hybrid” between a Brewster’s warbler hybrid mother and a chestnut-sided warbler father? 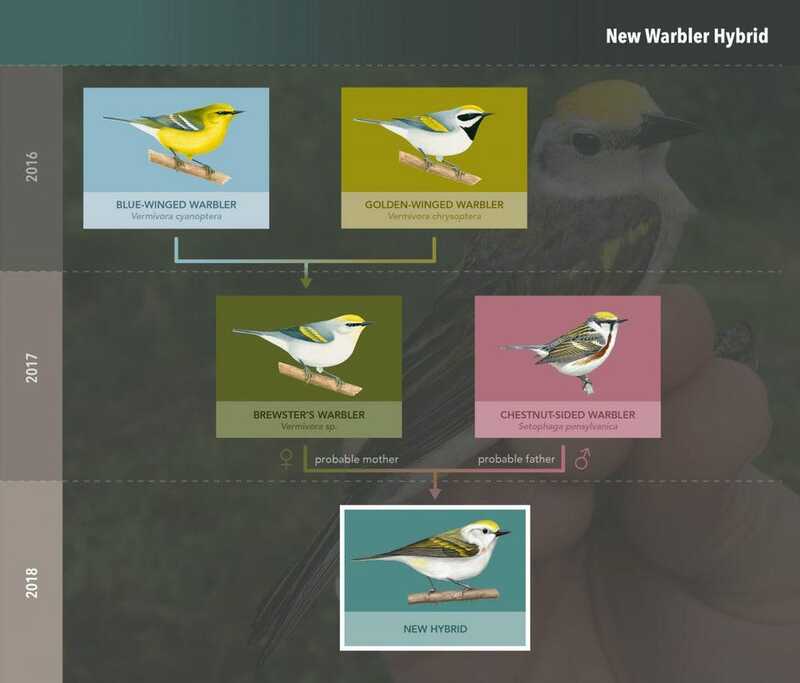 It certainly seemed like a far-fetched idea: even though Brewster’s warblers are hybrids themselves, they are hybrids between two closely-related species that are in a completely different genus from the more distantly related chestnut-sided warbler. But those strange spots on its neck, the lack of a dark eye stripe and the song — that remarkable diagnostic song! — were compelling. Intrigued by what he saw, Dr. Toews drove 4 hours from Cornell to meet Mr. Burket one week later and the next morning, they set up a mist net in the same area where the mystery bird had been singing repeatedly. Thanks to Mr. Burket’s intimate knowledge of this bird’s habits, it only took 4 minutes to catch it. Now that Dr. Toews had this mystery bird in-hand, he noted that it looked most like a juvenile chestnut-sided warbler – unlikely in early May when it was first spotted since most warblers don’t fledge until June. But at the same time, the bird’s white supercilium – which is black in adult male chestnut-sided warblers, and olive or grey in juveniles or females – and its faint grey cheek patch, were both more characteristic of Vermivora warblers. Dr. Toews took a variety of detailed photographs, and measurements of the length of the mystery bird’s bill and wings along with other physical characters for closer examination, and gave it a USFWS leg band bearing the unique number: 2850–44901. Before releasing the bird, Dr. Toews also took a tiny blood sample for genetic analyses. He then returned to his lab and methodically worked his way through all this information like an ornithological Sherlock Holmes. The clues were irresistible. Not only was song a strong indication that this mystery bird had a chestnut-sided warbler as a father, but the physical measurements indicated that this bird was most definitely a hybrid: bill length was longer than is typical for chestnut-sided warblers but it was within the expected range of Vermivora warblers (Figure 2a), and its wings were longer than any Vermivora warbler species but they were similar to chestnut-sided warblers. The genetic evidence was equally interesting: the mystery bird’s mitochondrial DNA (mtDNA) was 99% identical to golden-winged warblers, and 97% identical to blue-winged warblers — these species differ by only 3–4% (Figure 2b) — so this finding was as expected. 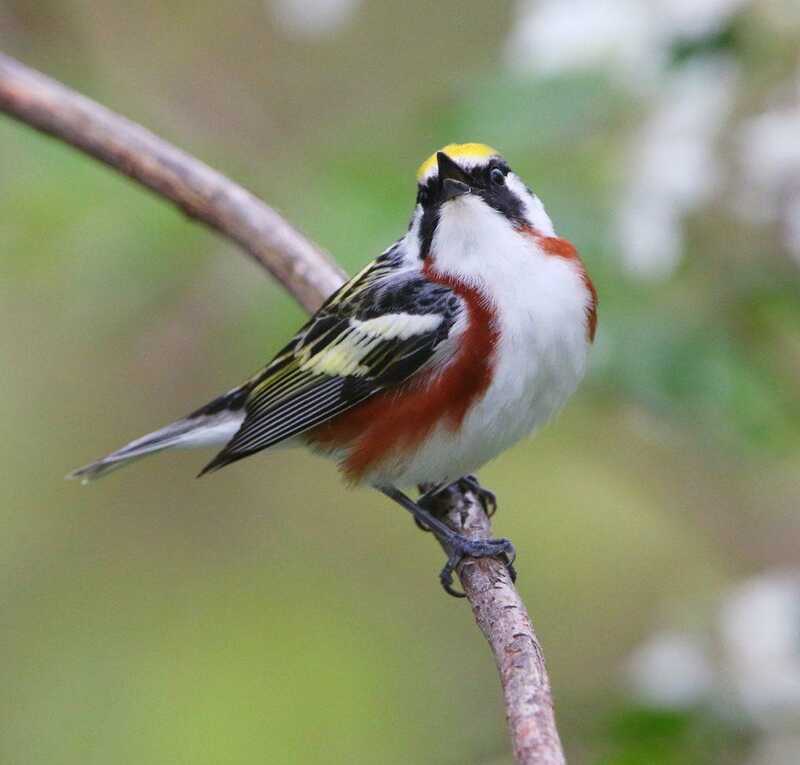 However, VermivoramtDNA differs from chestnut-sided warbler (and other Setophaga warbler species) sequences by more than 8% (ref), which once again, highlighted the probable identity of the mystery bird’s father. To further nail down the identify of the mystery bird’s putative father, Dr. Toews then examined single nucleotide polymorphisms (SNPs) that differ unambiguously from Vermivora warblers (n = 89 sites) and found that the mystery bird was heterozygous at all sites except one — which, in retrospect, is probably variable in chestnut-sided warblers, too. 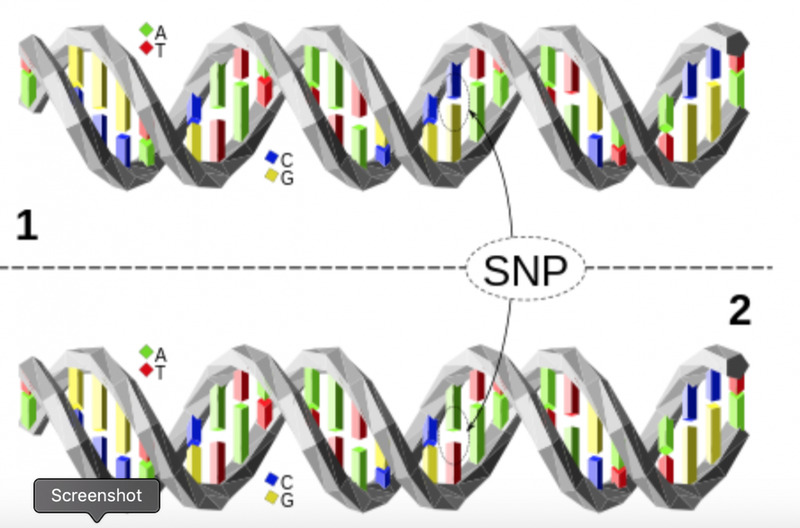 SNPs (“snips”) are a very common form of genetic variation seen in all living things, representing a change in just one nucleotide, or DNA building block, within the genome. Thus, finding that half of these SNPs matched those of the chestnut-sided warbler pointed towards the identity of the mystery bird’s father. Additional analysis of those SNPs that specifically distinguish golden-winged and blue-winged warblers revealed that two of the six originated from blue-winged warbler ancestry, and four came from golden-winged warbler ancestors. Thus, one-third of this mystery bird’s Vermivora SNPs came from a blue-winged warbler. Comparing the putative mother’s genetic index to other Vermivora warblers (Figure 2b), showed that no phenotypic blue-winged warbler had a genetic index as low as 0.33, whereas only two of 149 phenotypic golden-winged warblers had indices that high. In contrast, Brewster’s warblers have a mean genetic index value of 0.32, and 23% of Brewster’s warblers have exactly one-third blue-winged ancestry. So the mystery bird’s putative mother had a genetic index within the expected range for Brewster’s warblers, affirming her identity as well. 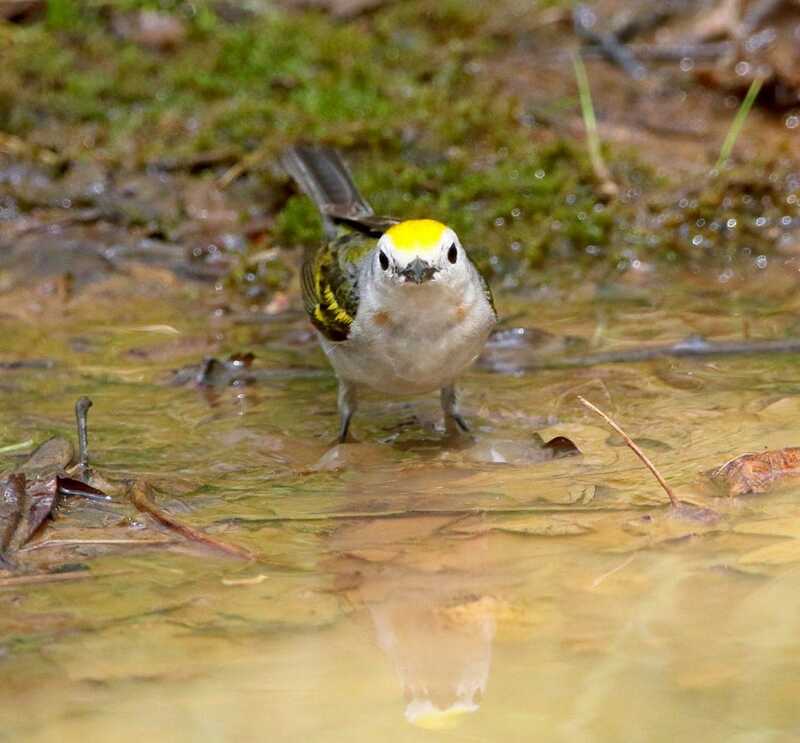 “The female is a Golden-winged/Blue-winged Warbler hybrid — also called a Brewster’s Warbler. 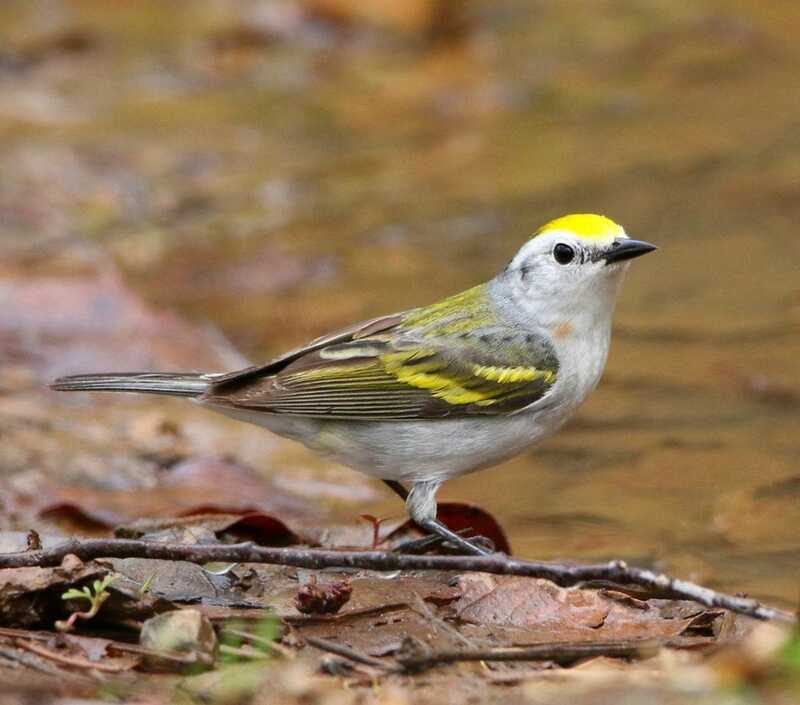 She then mated with a Chestnut-sided Warbler and successfully reproduced,” Dr. Toews concluded. Predicted family tree of warblers leading to the newly-described three-species hybrid. Blue-winged, golden-winged, and Brewster’s warblers by Liz Clayton Fuller; chestnut-sided warbler from del Hoyo et al. (2018) Handbook of the Birds of the World Alive; new hybrid “Burket’s warbler” by Jillian Ditner. (Graphic courtesy of the Cornell Lab of Ornithology. )CORNELL LAB OF ORNITHOLOGY. 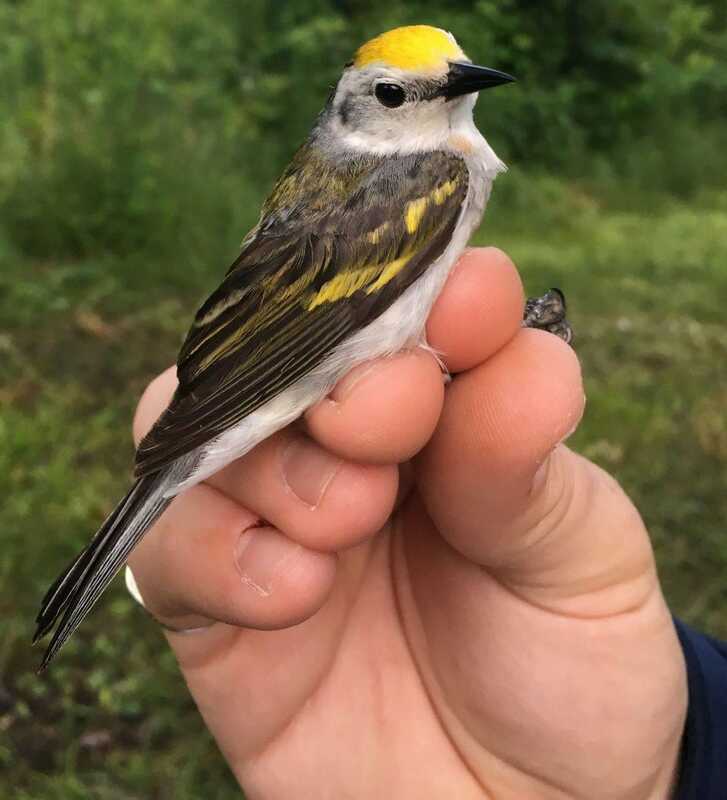 In fact, hybridization between golden-winged and blue-winged warblers has been increasing during recent decades throughout the Northeastern United States and extending into Canada. Most of this hybridization results from blue-winged warblers moving into golden-winged warbler habitats. This is motivated by the effects of warming climate and the loss of the blue-winged warblers’ preferred scrubland habitat. Further, golden-winged warbler populations are declining, so suitable mates amongst this species are limited. What does this hybrid warbler — now formally known as Burket’s warbler — reveal about species barriers, especially in songbirds? 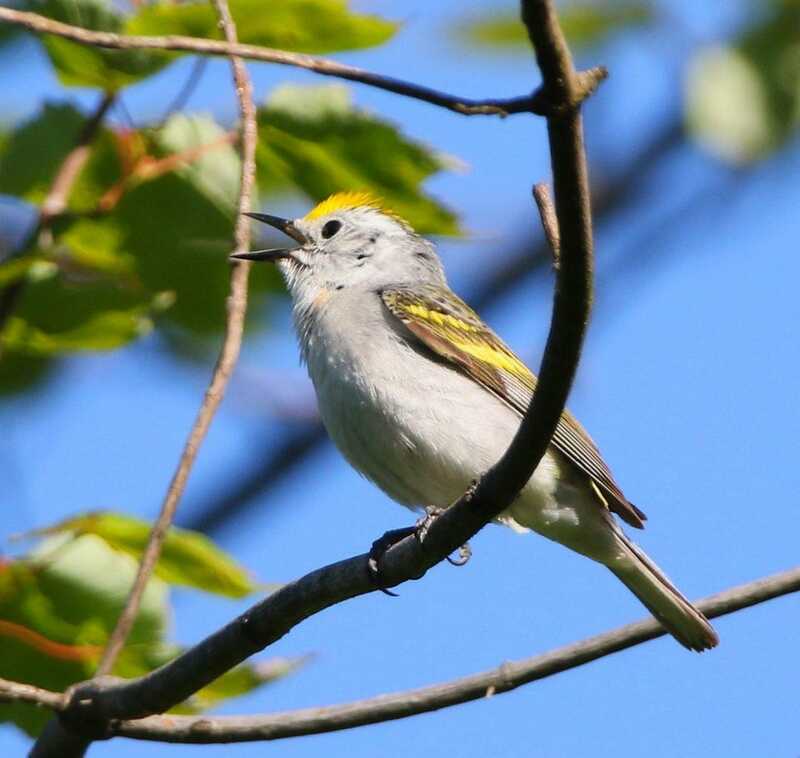 “This kind of fits with the conventional wisdom in these warblers too — that species barriers are maintained by ‘pre-mating isolating barriers’ [such as song] and not as much by post-mating genetic incompatibilities,” Dr. Toews added. Male Burket’s warbler at “the birdhole” on Lowell Burket’s family property in Pennsylvania. This bird is wearing a USFWS aluminum leg band bearing its own special number, 2850–44901. Might this Burket’s warbler successfully father his own ‘children’ or will his mixed ancestry make him an undesirable mate? Dr. Toews released the bird, and is planning on keeping an eye on the birdhole on Mr. Burket’s family property to see what the future holds.